Brother Jesse Blog: Pre-HDOA Twitter Army Interview Series with Abel Muhammad: "The #FarrakhanTwitterArmy is an absolutely critical method of reaching our people." Pre-HDOA Twitter Army Interview Series with Abel Muhammad: "The #FarrakhanTwitterArmy is an absolutely critical method of reaching our people." Abel Muhammad (AM): I use social media to help spread the message of Islam as taught by the Honorable Elijah Muhammad and the Honorable Minister Louis Farrakhan to as many of our people as possible. I also use it to keep up with news, connect with friends, family and believers who are in other cities/countries. 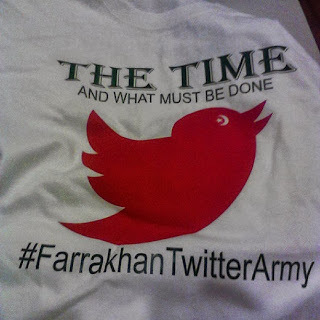 AM: The #FarrakhanTwitterArmy, in my estimation, is an absolutely critical method of reaching our people with the Truth which God and His Messiah are revealing through the Honorable Minister Louis Farrakhan. The #FarrakhanTwitterArmy is reaching people in the social media community that normally would not access the Truth because they don't go to traditional sources(ie-newspaper, radio, etc) for information. The #FarrakhanTwitterArmy, using modern technology (equipment) is delivering the message from the Messenger of God (HMLF) to the masses of people on a scale that would be near impossible to reach otherwise. I'd say the work that is being done is tremendous! AM: I am so looking forward to the TweetUp! To be in the room with so many that have dedicated time and effort to help disseminate the message of #TheTime - it will truly be a historic day that I do not want to miss.